I put together a Coastal Color Combo this week with deeper blue tones for fall. My hope is to share a Coastal Color Combo weekly to keep you inspired with all the fabrics, paints, and textures that are available through us and that inspire me. You can follow me on instagram for the weekly picture before the blog post unfolds. So, I mentioned in last weeks post we received many memos of some new Schumacher fabrics. There are a few more here, but the one that really inspired me is the large coral jacquard by Robert Allen. The repeat is quite large and it is a heavy weight fabric which would be great for an arm chair or headboard. I put together a board for inspiration below. The accents follow. Hand made “flower” arrangement by Karen Robertson. Made of seashells! The accents are some of our favorites in the shop. Hand-crafted, natural, and made of recycled materials. These are some of the criteria we use when choosing eco-friendly pieces for the shop. 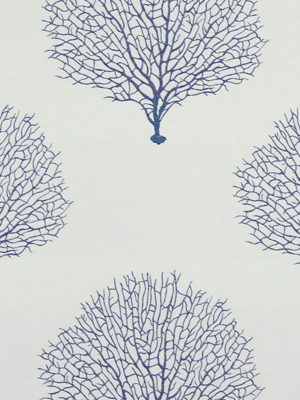 With the exception of the Tree Branch fabric by Robert Allen, all the fabrics are natural cotton or linen. 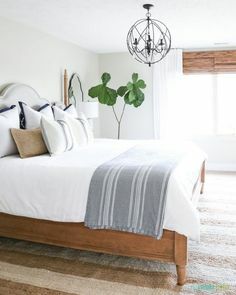 I would suggest organic linen for the bedding to top it all off! What would you choose? Would you like this color combo?